Oscar® winner Nicolas Cage (Leaving Las Vegas) stars in this intense and chilling thriller about one man’s desperate search for his missing child. The recital of this poem by our hero blatantly foreshadows the events about to play out onscreen. The professor’s son Charlie starts having strange visions of a vulture and a shadow figure lurking just outside his bedroom window. Then, on Halloween night Charlie is kidnapped during the annual street parade. Nearly a year later, just days before Halloween, we see our desperate dad stapling missing person posters with Charlie’s face on them all over New York City (in the film, Toronto, Canada stands in for NYC and it’s pretty convincing). Now, he’s teaching his class Washington Irving’s “The Legend of Sleepy Hollow,” another story that reflects plot points from the film (mysterious disappearances and shadowy figures of legend). Kristen and Mike’s marriage has fallen to pieces because she blames Mike for Charlie’s disappearance. The cops don’t have any leads. Worst of all, Mike has started to have strange visions of his own, including seeing Charlie on the streets of New York wearing the same costume as when he disappeared (not unlike the red coated phantom that tormented Donald Sutherland in Don’t Look Now). As Mike begins to dig deeper into the cause of his son’s disappearance, the film becomes less grounded in reality and muddied by competing B-lines. I was reminded why Nicolas Cage was a star during the first act of the film (he delivered some genuinely tortured moments), only to be reminded in the third why he’s become somewhat of an oddity in modern film. He has some weird line readings here and there, but for the majority of the film his performance is solid and grounded. Sarah Wayne Callies can always be counted on to emotionally anchor a scene and she does so expertly throughout. 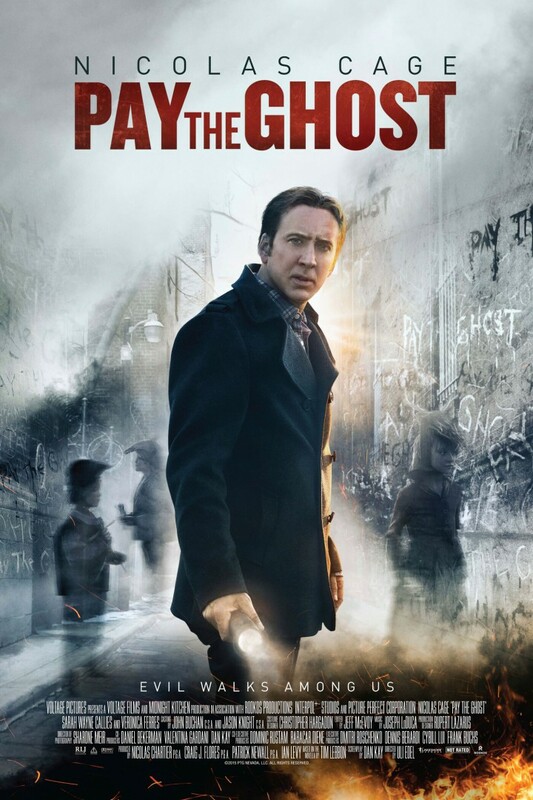 Visually, Pay the Ghost is a mixed bag. Corny CGI pops up during some climactic moments, but much of the practical work and photography is top shelf. I would recommend this film to fans of old school Celtic Paganism films, but don’t count on the same satisfying climax that many of those classics gave us. Pay the Ghost sort of screws the pooch when it comes to an artfully rendered conclusion. SYNOPSIS: Oscar® winner Nicolas Cage (Leaving Las Vegas) stars in this intense and chilling thriller about one man’s desperate search for his missing child. One year after his young son disappeared during a Halloween carnival, Mike Lawford (Cage) is haunted by eerie images and terrifying messages he can’t explain. Together with his estranged wife (Sarah Wayne Callies, The Walking Dead), he will stop at nothing to unravel the mystery and find their son—and, in doing so, he unearths a legend that refuses to remain buried in the past.